Remember how we were going to get the Avengers: Age of Ultron trailer during the October 28th Marvel’s Agents of S.H.I.E.L.D. episode? Well someone decided to crash the party, and if you believe Marvel, it was Hydra. Avengers: Age of UltronChris Evansjames spaderJoss WhedonKevin FeigeMarvel Cinematic UniverseMarvel StudiosRobert Downey Jr. It seems that Robert Downey Jr. just can’t get enough of Marvel. According to various reports, while there may not be an Iron Man 4, Robert Downey Jr. has signed on for a major role in the as of now untitled third installment in the Captain America franchise, and it could have some huge implications for the Marvel Cinematic Universe. RDJ has been making the rounds recently for his film The Judge, and naturally all anyone wants to talk about is his future as Iron Man. Originally, he was contracted for only one more Marvel movie, Avengers 3. However, it appears that Marvel Studios president Kevin Feige has major plans for Phase 3, which includes Captain America 3, Ant-Man, Doctor Strange, Guardians of the Galaxy 2, Thor 3 and of course, the third Avengers. Feige may just be gearing up for Marvel’s biggest storyline of the last decade. The thought is that this casting will lead to the Civil War series that ran in the comics in 2006 and 2007. 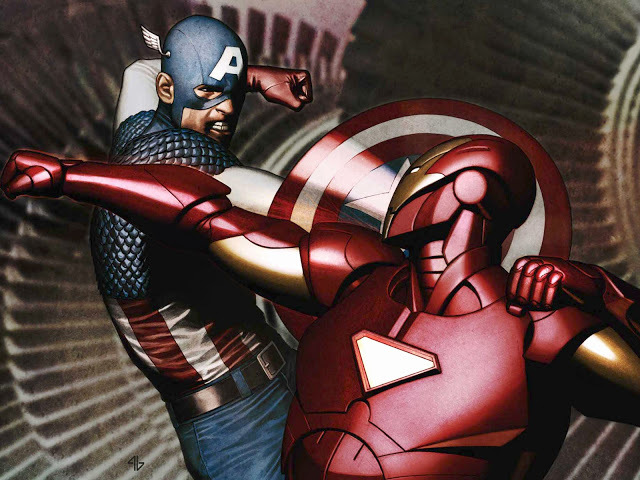 That would put Captain America and Iron Man on opposite sides of the superhero registration act, dividing the former teammates and friends, and pitting half the Marvel Universe against each other, Cap opposing the act and Iron Man backing it. This could also help explain some of the recent rumors about Sony and Marvel working together, and Spider-Man showing up in the MCU. Afterall, he did play a big part during Civil War. So, while the deal has yet to be signed, this is obviously the major announcement that RDJ has been teasing for the last few weeks. Granted, we’ve seen stuff fall through like Joaquin Phoenix as Doctor Strange or Edgar Wright leaving Ant-Man, but I have a feeling that this one is going to get done. Especially considering that Iron Man 3 grossed more than a billion dollars, so while they’ll back up the Brinks truck for RDJ one more time, it will all be worth it. captain america 3Chris EvansIron ManMarvel Cinematic UniverseMarvel StudiosRobert Downey Jr.
Joss Whedon, come on down! You’ve just been chosen to continue on the path of greatness and while adding to your god-like status amongst the human population! According to several news sources, ranging from the Hollywood Reporter, EW.com, Newsrama etc., Joss Whedon is back in the saddle as your writer and director for Marvel’s The Avengers 2. In the deal, Mr. Joss “I Own The World, Bow Before My Awesomeness” Whedon, signs a deal with Marvel Studios that keeps in the fold through the end of June 2015. In that, he will cover his duties as director and writer for The Avengers 2, as well as helping develop a live action series for ABC and, according to the Marvel Studios’ press release, “will also contribute creatively to the next phase of Marvel’s cinematic universe.” Basically, as I have read it, he will take the Jon Favreau role in making sure that the universe that Marvel Studios has cultivated will be ushered into the next set of movies, culminating in The Avengers 2 movie. You can bet that the TV show will deal in the Avengers universe and it is safe to say that it is NOT the Guillermo del Toro Hulk series being developed for ABC apparently. Excited much? Yessir. Let us face it, Joss Whedon knows his characters and his television. While not successful all the time in terms of nielsen ratings, his television shows always are great and at least will cater to the cult crowds and die hard geeks his drops his wisdom on. Plus if it’s set in the Marvel Universe, umm, insta-hit? From a Hollywood perspective, this should be zero surprise of course. The Avengers has made 1.5 BILLION worldwide. A large part is because not only the commercial acclaim of putting together the most brilliant way to market your movie (uhh, Iron Man, Iron Man 2, The Incredible Hulk, Thor, Captain America: The First Avenger? Yeah, those were basically marketing teasers for that movie, profitable ones too at the very least), but the critical acclaim that got people coming back for more. The onus on Whedon and Marvel was making sure the characters were enjoyable to watch and developed to where they both electrified the screen individually AND as a team. Whedon solidified the Marvel Studio’s universe in this movie because he made sure this ambitious project did not implode like a dying star. With egos and sheer enormous size of this project, this could have been an unmitigated disaster with everything that was going on but instead, Mr. Firefly himself controlled the movie and its stars (and the future of this universe) and made sure the next several movies are events flicks that people of all walks and sizes will need to see. So let’s recap, this will be Joss Whedon’s universe for the next three years and with Iron Man 3 for May 3rd, 2013; Thor: The Dark World in November 8th, 2013; Captain America: The Winter Soldier for April 4th, 2013; Guardians of the Galaxy launching on August 1st, 2014; with possibly Edgar Wright’s Ant-Man figuring into the equation too, this will probably confirm Avengers 2 hitting theaters in 2015, right when the contract ends. Not too mention the TV show that, crossing my fingers and just a hypothetical guess, will probably be S.H.I.E.L.D. related? Excited? You know it baby. So much that this ScarJo pic will be used to match the badassness of this news.